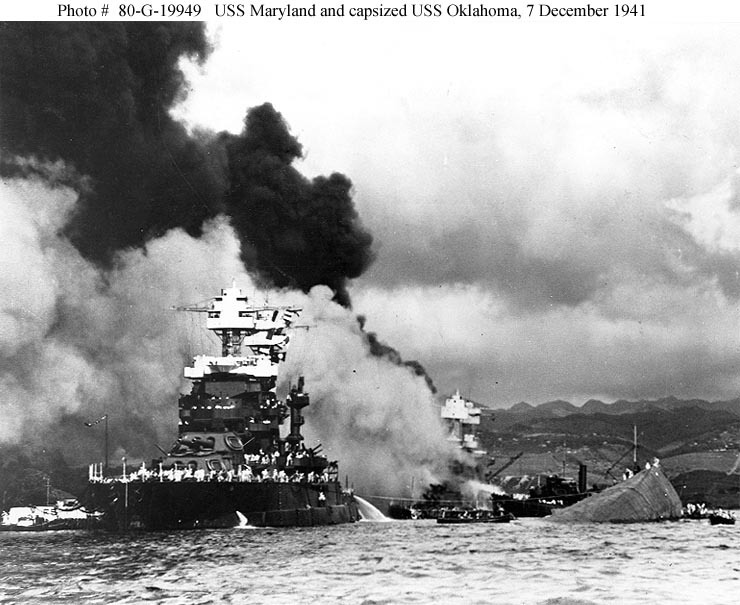 On 7 December 1941, USS Maryland (BB-46) was moored inboard of USS Oklahoma (BB-37), and was thus protected by her when Japanese torpedo planes struck. 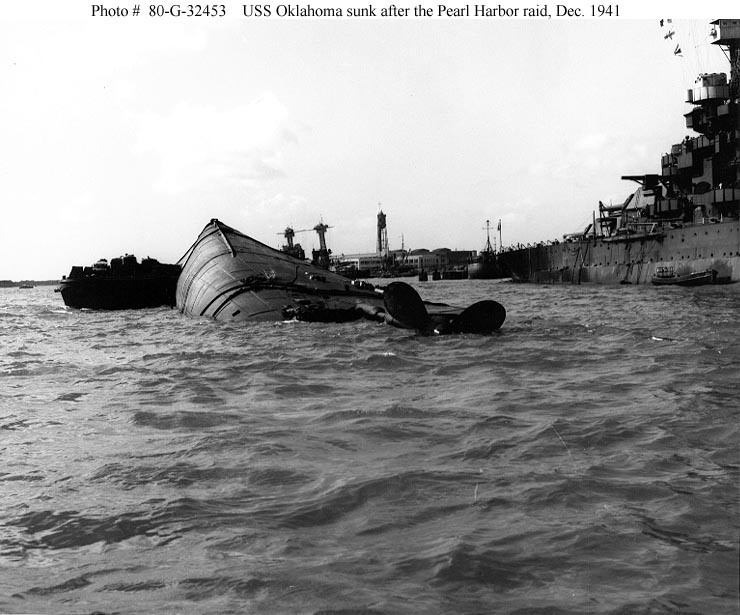 The unfortunate Oklahoma, an older ship with much less adequate protection against underwater damage, was hit by up to nine torpedoes. Her hull's port side was opened almost completely from below the forward gun turret back to the third turret, a distance of over 250 feet. She listed quickly, her port bilge struck the harbor bottom, and she then rolled almost completely over. 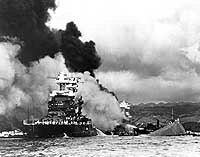 Oklahoma came to rest less than twenty minutes after she was first hit. 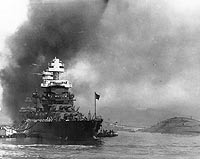 Some of her starboard underwater hull and the starboard propeller were now all that showed above the surface of Pearl Harbor. 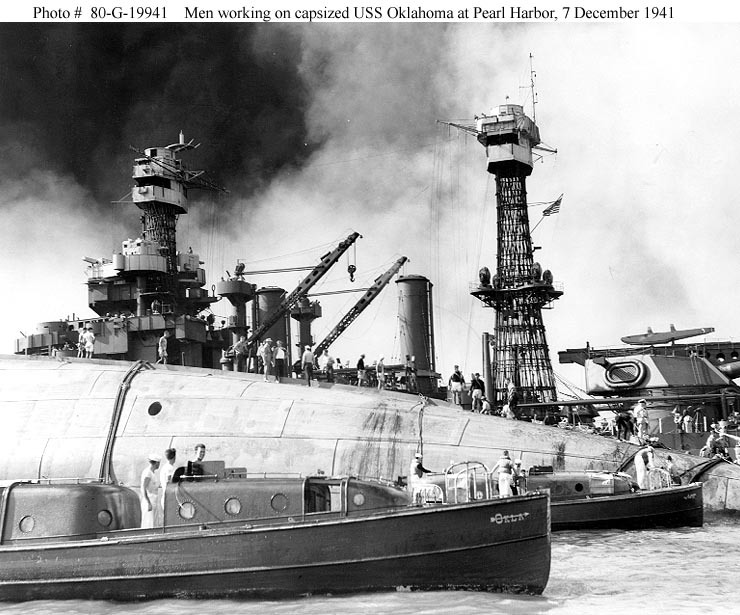 This page features views of USS Oklahoma and USS Maryland on 7 December 1941 and during the following days. Seaman First Class James Richard Ward, USN. USS Maryland at berth F-5, with men working on the capsized hull of USS Oklahoma alongside, during or immediately after the Japanese attack. USS Tennessee (BB-43) is visible in the left background. The capsized hull of USS Oklahoma (BB-37), with a barge alongside to support rescue efforts, probably on 8 December 1941. USS Maryland (BB-46) is at right, and USS California (BB-44) is in the center distance.